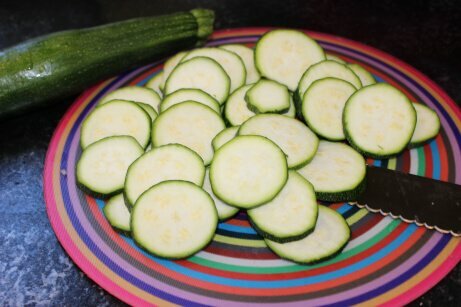 Cut a zucchini into 5mm thick circles. Put the cut zucchini into a bowl, with just enough water to cover it. Put a microwave safe lid on the bowl. Microwave at 500W for 5 minutes and 30 seconds. Eat after it cools down a bit. Only 17 calories per 100g, so they are used in weight reduction and cholesterol control programs. They Contain no saturated fats or cholesterol. The peel is good source of dietary fiber which offers some protection against colon cancers and helps reduce constipation. Relatively moderate source of folates, consists of 24 mcg or 6% of RDA per 100 g. Folates are important in cell division and DNA synthesis. When taken adequately before pregnancy, it can help prevent neural tube defects in the fetus. Very good source of potassium which is a heart friendly electrolyte and important intra-cellular electrolyte; helps reduce blood pressure and heart rates by countering effects of sodium. Fresh zucchinis are rich in vitamin A; provide about 200 IU per 100 g.
Golden skin zucchinis are rich in flavonoid poly-phenolic antioxidants such as carotenes, lutein and zeaxanthin. These compounds help find and remove harmful oxygen-derived free radicals and reactive oxygen species (ROS) from the body that play a role in aging and various disease process. Fresh pods, are good source of anti-oxidant vitamin-C. They provide about 17.9 mcg or 30% of RDA per 100g. Good in B-complex group of vitamins like thiamin, pyridoxine, riboflavin and minerals like iron, manganese, phosphorus, zinc and potassium.